The Wizard of Crescent Keep by Lady Saera is the special colored edition of the first book in the Wizard of Crescent Keep series. When Christopher finds an ancient tome, he's suddenly whisked away to another world where he's adopted into a Sorcerer's family and gains a younger brother, Ralfeson. Years later, Christoper has become the High Wizard, Crescent, and is investigating a series of disappearances tied to the Sorcerer called Minger the Mad. As he works to navigate his current feelings for Persephone and his past relationship with Silwyna, his brother attempts his own devious plan to win Persephone's affection. When Silwyna returns to his life, he discovers shocking secrets from the past. To find a cure for her vampirism, Silwyna turns to an untrustworthy source. Lady Saera explores a world of fairy tales and vampires with slightly absurd characters and magical situations. One of the characters that stands out is Crescent's familiar, a talking frog named Briijh who acts as his confidant and adviser. Briijh has a spunkiness about him that plays off Crescent well. He's never afraid to speak his mind to Crescent, while always maintaining a respectfulness about his personality. He's not the most bizarre of the characters, which include a entertaining range of vampires, demons, and wizards. There are fun appearances by a talking stone owl, and a dragon who has a part to play in how this world works and how the story moves forward. The plot is reminiscent of A Midsummer Night's Dream with mixed up relationships that dip in and out of magical issues. Crescent is conflicted between a possible future with Persephone and his past with Silwyna, while Silwyna has a complicated relationship with the count she's married to, and she's swayed by Minger with the allure of a cure. Then Ralfeson is in love with Persephone and, in his attempt to win her over, he ends up spelling her to love this other man so more fun complications ensue. Lady Saera weaves through perspective by playing with first and third person, and dipping into various viewpoints. The inclusion of Minger and Ralfeson allows readers a chance to better understand their motives. Ralfeson is painted as a sympathetic character rooted in his issues with living in his brother's shadow. Minger is seen as the opposite, the typical fairy tale villain who only “helps” others when it suits his goals. Crescent has a dual perspective as both young Christoper new to this world of magic who has to discover his place within it, and his present day self as a Wizard with the experience and knowledge of his position. Stunning illustrations with soft colors and vivid details add a sense of wonder to the story. 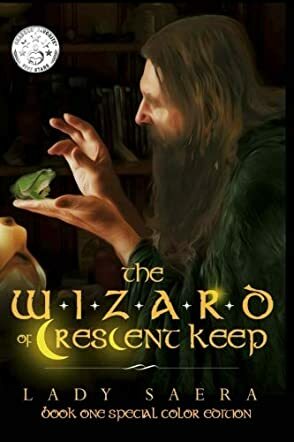 The Wizard of Crescent Keep is a Gothic fairy tale with talking frogs and magic, vampires and demons that is sure to please fans.